Store Your Stuff is the perfect self storage solution for homes and businesses in need of some extra space. Whether you need a place for household furniture storage, personal possessions, business goods, archive documents or vehicles, Store Your Stuff offers an affordable and efficient way to keep your all items in one place. 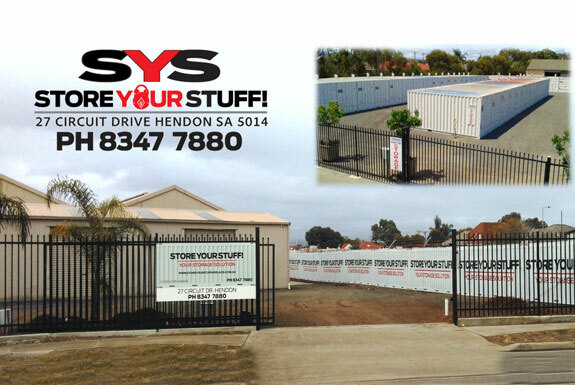 Located in the western suburbs of Adelaide only 15 mins from the city, close to West Lakes Mall, West Development and Port Road, we make it easy to Store Your Stuff. Store Your Stuff offers a clean, dry and secure storage space for you to store your valuable possessions, however long you may need it. Choose from weekly, monthly, or long-term storage space, with storage prices starting at just $39* a week! Our self storage Adelaide facility can be useful for short-term storage, such as during a move, or for storing items you want to keep, but just don’t have a place to put. Businesses often use a storage facility to store archived documents or additional equipment, while families may rent local storage for Christmas decorations or kids toys. Feel free to contact our office on 08 8347 7880 or after hours on 0455 088 559 if you have any other further queries regarding storing your goods. Our storage facility is located on a site that allows you access to your goods 24 hours a day, seven days a week. This means that you never have to work your schedule around our hours if you need access – you can come anytime that suits you! This is particularly handy if you are running a business and need late and early access out of office hours, or remember something in the middle of the night. Our storage solutions Adelaide appeal to many tradies looking to store excess equipment, who need to be able to collect and use it anytime. Each of our 20-foot storage containers are only accessible behind our high fencing when you enter your unique pin code into the electronic door lock. Each container is then also fitted with its own lock box. We’re always keeping a watchful eye over the site with our state-of-the art CCTV system, ensuring we offer the best security to our customers. You’ll find a site manager onsite during business hours too, to make sure that everything runs smoothly and to provide you with that extra peace of mind. Store Your Stuff is an easy and affordable solution for all your storage needs. Ready to move in? Feel free to use our online booking form or contact the Store Your Stuff office on 08 8347 7880 or after hours on 0455 088559. If you have any other questions about storing your goods at our storage facilities Adelaide, please email us at info@storeyourstuffadelaide.com.au.